Corned beef is an economical product that can be purchased in a can or fresh from the deli counter in your supermarket. Rather than have it in sandwiches and rolls with pickle why not turn it into a complete meal for your hungry family? 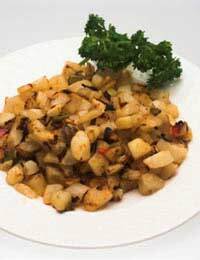 Corned beef hash is one of those old fashioned recipes that are becoming popular once more. Purchase cans of corned beef and keep in your store cupboard ready to feed unexpected guests or to feed your family when you are counting your pennies. Some people assume that corned beef is still coated in a thick layer of fat but that is not the case. Many producers now sell a lean version without any visible fat. Place your can of corned beef in your fried for a few hours. You will find that the meat is easier to slice or cube when chilled and will not break up or crumble so easily. Wash the potatoes and leaving the skin on cut them into even sized small cubes. Scrub the carrot and parsnip removing any blemishes and cut into similar sized cubes. Place into a pan of salted water and simmer until cooked through. Remove from the heat and drain. Season with the salt and black pepper. Remove the corned beef from the can and cut into even sized cubes about half an inch in size. Heat the butter in a heavy based frying pan and add the chopped onion and garlic. Fry until it is slightly brown. Add the cooked potato, parsnip and carrot mix and continue to fry gently until the potato is brown and crispy. Add the corned beef and peas and mix thoroughly taking care not to break up the cubed corned beef. In a large heat proof casserole dish add the baked beans and the Worcester sauce and stir gently to mix together.Place the vegetable and corned beef mix on top of the baked beans and cook in the pre heated oven for twenty minutes. When the corned beef hash is nearing the end of its cooking time heat the oil in a non stick frying pan and fry the four eggs. Serve immediately with a freshly fried egg on top of each portion. Try using mashed potato mixed with chopped cooked brussel sprouts and place the mix on top of the beans and corned beef to create a bubble and squeak type hash. Grated cheese can also be scattered on top for a bubbling golden topping. The eggs can be added to the recipe by making four wells in the mix and breaking the eggs into them before baking in the oven. There are many variations on the recipe for corned beef hash, why not try to think of more using your store cupboard stock?